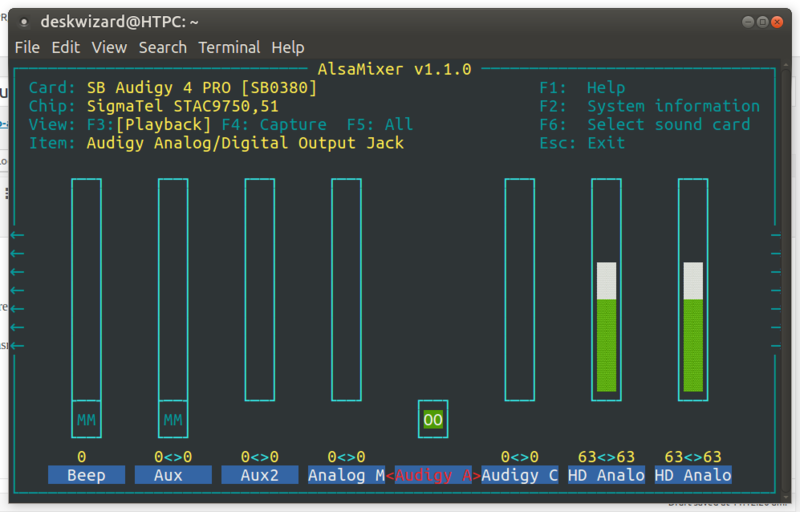 I’ve recently been bitten by the “Volume range anomalies” issue with my Audigy 4 Pro card under both 16.04 and 18.04, more specifically in my case the volume steps jumping from the first step straight to the 20th, losing all low volume granularity, as easily seen in ‘alsamixer’. Adding ‘ignore_dB=1’ after the line ‘load-module module-udev-detect’ in ‘/etc/pulse/default.pa’, did the trick. This has to be the least objective computer hardware tests I even made…. I managed to install Ubuntu Mate 16.04.1 (kernel 4.4.0-66 at the time of writing) on the T100TA using John Well’s excellent tutorial (here). So here is a bit more detailed instructions for building the latest bluez (5.44 at the time of writing), basically a step by step version of step #2 of the previously mentioned tutorial (a.k.a "automake or autoreconf (may need to install dependencies“). Please note that I’m using Ubuntu Mate myself, but this should apply to all variants. Now you can go back to the original article (this one) and carry on with the instructions starting with step 3. Wow, am I pissed at Samsung right now (again). I’ve been trying to get the analog audio working on my Series 4 LCD TV to make some tests but couldn’t get it to switch to analog. I went through every menu 10 times (at least 10 times) but still couldn’t find an option to change that. Turns out, the answer from Samsung from 2013 is basically, update your drivers. LOL, no. Very much no. So after a bit of googling around, it seems I wasn’t the only one with that issue; turns out that the (insert swear word) TV will NOT switch from digital audio to analog audio if it senses audio capabilities from the graphics card, WHICH THEY ALL DO. It’s 2017 for …. sakes. The answer? Get in the “Service Menu” and toggle the DVI Audio flag from AUTO to DVI in the “Option Bytes” section. In my case, to get the service menu, with the TV off, press the remote buttons in the following order: mute 1 8 2 power, the TV will turn on as usual and then display the service menu as an over lay. Note that to be able to toggle the option, you have to be on the specific input, which is HDMI2 in this case. BEWARE THAT THE SERVICE MENU IS SCROLL DOWN ONLY. LEFT KEY PRESS WILL ENTER THE CURRENT HIGHLIGHTED ITEM. You’ll scare the crap of yourself if you end up hitting the wrong options. Trust me ! Also, BE ……. CAREFUL! THAT MIGHT BRICK YOUR TV! Turns out.. Guess what… Changing the …. input name DISABLES OVERSCAN. UPDATE: It has been pointed out to me that this only works for ‘Ironlake’ GPUs and later (a.k.a. Intel processors with integrated graphics). Thanks RD94 for letting me know! UPDATE #2 : As mentioned by Bryan Rodriguez in the comments, if the following instructions don’t work for you, you might want to list the “pipes” (a.k.a the argument to the ‘-p’ option) using the ‘-l’ (lowercase L) to list the pipes and try changing the ‘-p’ option argument to another of the ones listed, if any. Thanks for pointing this out ! UPDATE #3: Seems like putting the machine to sleep will mess the panel fitter command ran on boot (ie. it’ll be back to overscanning), I will not be able to test a workaround for a little while, but I’m sure there’s a way­. I’ll post an update once done. I’ve been having trouble using xrandr with the commands I normally use with AMD and Nvidia cards for overscan. On Intel graphics, I get error messages similar to this, since the commands are not supported. I finally found the answer here and got it working with a bit of fiddling. First, install the intel-gpu-tools package to acquire the intel-panel-fitter tool. Note that you will have to change the x and y values for your specific TV/monitor. The man page is located here if you desire more information on this tool. to /etc/rc.local (sudo nano /etc/rc.local) BEFORE the ‘exit 0’ statement. EDIT: Using those instructions worked for me to force HDMI output, else it always switches back to analog audio. I recently updated my machines to Ubuntu Mate 16.04.1 (x64) so here is the configuration required to successfully build the A20 SDK. I broke it all down in 11 easy step for my and everyone else’s pleasure. These instructions assume you have already downloaded and extracted one of the A20 SDK for the Olinuxino-A20 (list below). Install the version of the OS you selected, all the updates and reboot as asked before continuing. Compiling older android versions requires make version 3.82 but the included make version is 4.1 with the new version of the OS. Here are the instruction to revert make version back to version 3.82. Please note that I am unaware of any consequences at the time of writing but I cannot guarantee that it won’t cause any issues. Note: I install repo in ~/Bin instead of ~/bin like proposed by google for one simple reason; LiveSuit installs itself to ~/Bin anyway. WARNING: Do NOT use these instructions, as they broke some time ago. Please see my updated instructions for building on Ubuntu Mate 16.04.1 here. I have been playing around quite a bit with my OlinuXino-A20-Micro lately. Quite a nice little thing! Figured since I spend so much time getting my build environment for android working correctly that it could be useful for other people. In the past I used Ubuntu 12.04.5 LTS as a build OS but recently moved to Ubuntu Mate 14.04.2 LTS. I have provided the instructions for both OSes. I broke it all down in 10 easy step for my and everyone else’s pleasure.